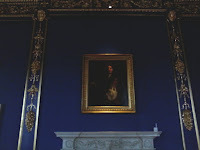 Welcome to Queen’s House. 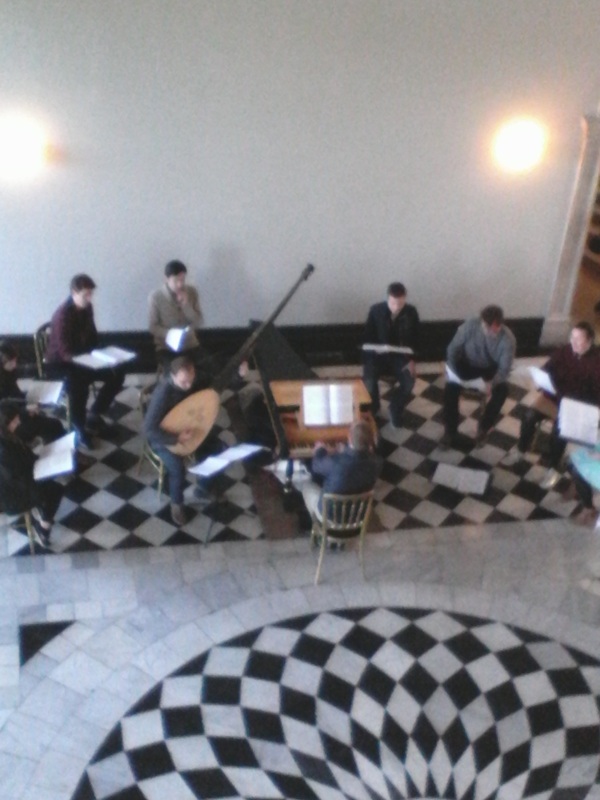 After a massive refurbishment Inigo Jones’s gem has reopened to the public. 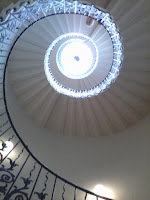 The Tulip Staircase is probably its most famous feature but there is such a lot to see here in the heart of Greenwich, home to so much history. 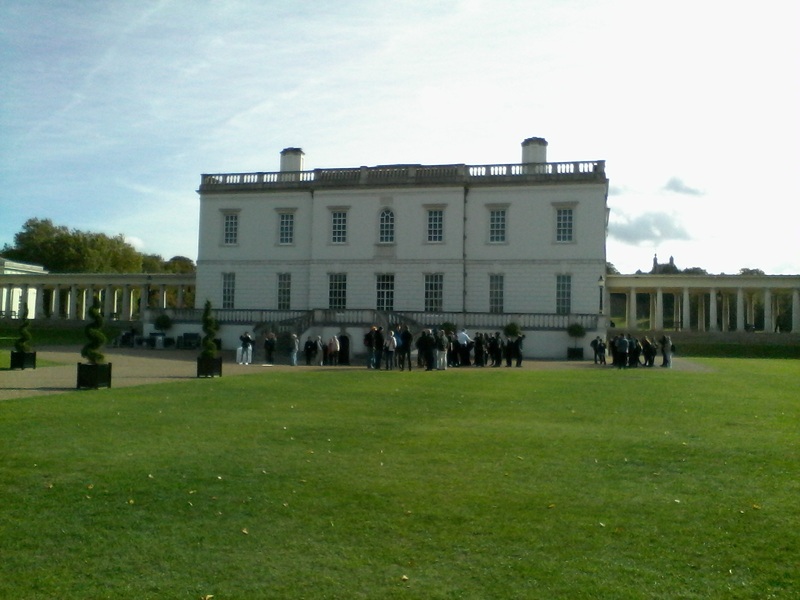 The Queen's House sits opposite the Old Royal Naval College. If you look carefully, in the background of the first picture you can see the Royal Observatory. And yes, that's the River Thames between to two iconic buildings in the one on the right. 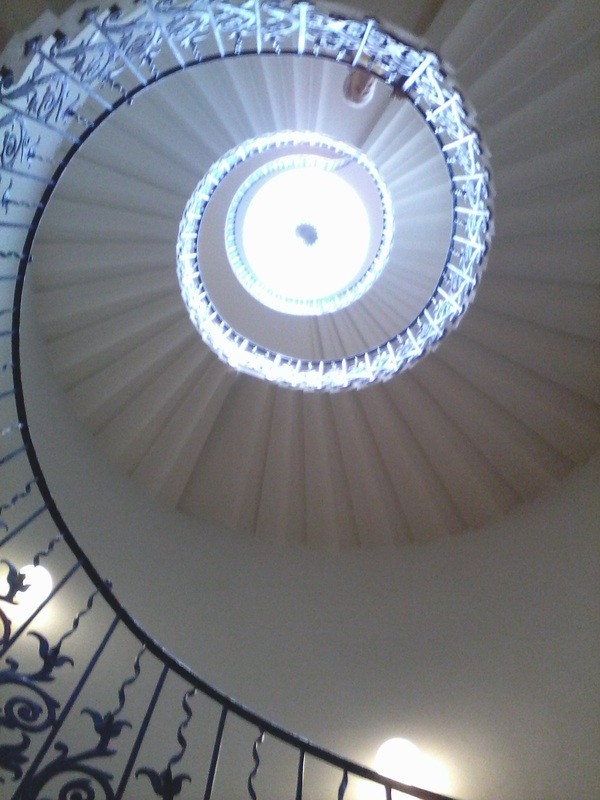 The Tulip Stairs weren't the first in the Queen's House. 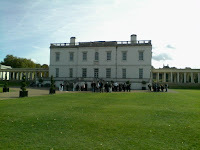 The Greenwich Park side of the Queen's House was originally the front of the building and the South Stairs formed the main stairway. Its two half landings were resting places for ladies in their heavy dresses! Changes from the 1660s meant the side that faced the river became the main frontage. 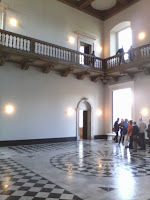 The South Stairs then became a discreet route to the Queen's private apartments. The Tulip Stairs were the first centrally unsupported stairs in the country. The stone treads lock so perfectly into each other and the wall that no central structure is required to support them, giving this unobstructed view to the sky. The wrought iron rail has been restored to a striking smalt blue and the designated tulips are more probably lilies. The Grand Hall is a perfect cube. 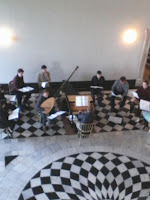 During our visit a music group was practising. When we came back through the hall they had gone and it was being set up for a function, a dinner to celebrate the reopening of the house. We don’t know whether or not the two were connected but it was a bonus to have a short concert while we stood on the balcony. While these images of Inigo Jones are almost impossible to see (the flash didn’t work on my camera) it seems disrespectful not to post them. 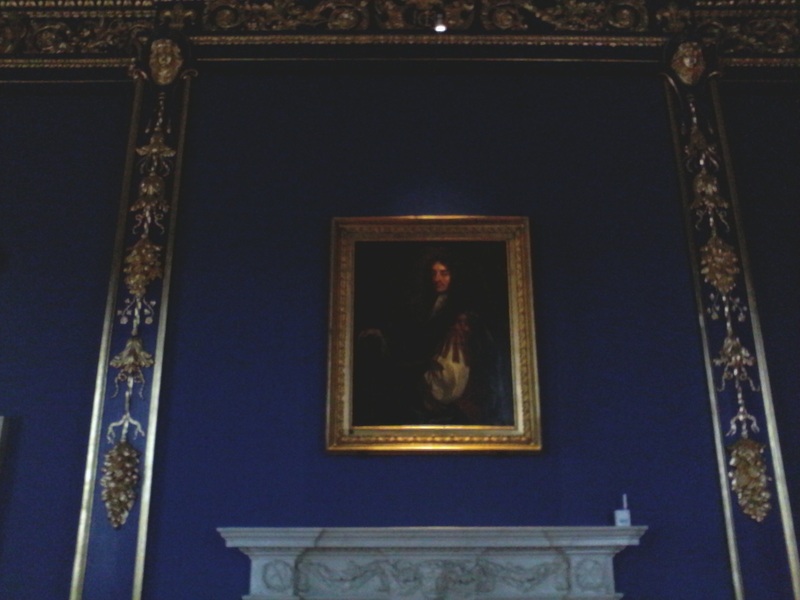 And here in the King’s Presence Chamber you might just be able to recognise the image of Charles II. On a plinth outside on the park side, and nothing to do with Queen’s House, is the biggest ship in a bottle I have ever seen. 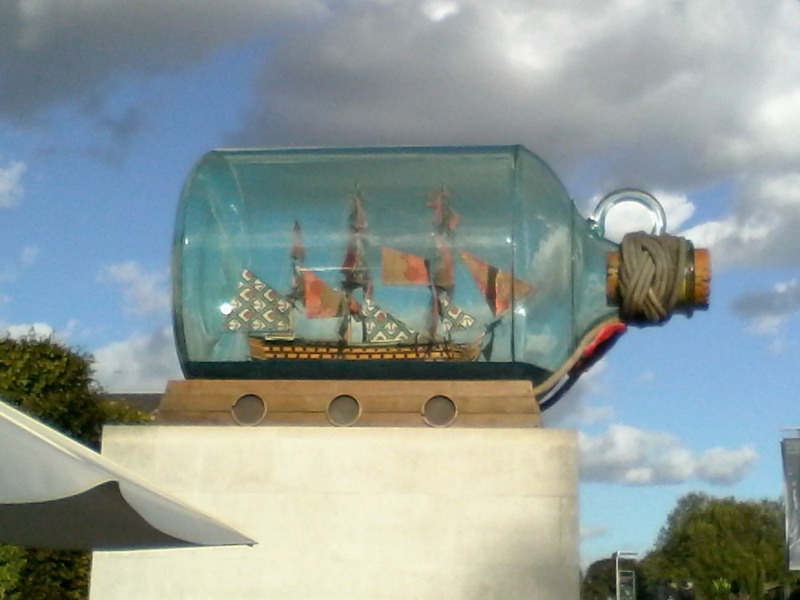 In Royal Greenwich, so famous for its naval history, it seems a suitable final image. I may have mentioned before that I live within two miles of this wonderful historical area. With the National Maritime Museum, the Queen’s House, the Old Royal Naval College and others, it is a glorious architectural feast. And that’s only on the outside. 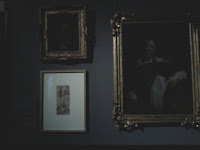 Most if not all of these treasures are open to the public and what can be found within is equally spectacular. Visit if you can.